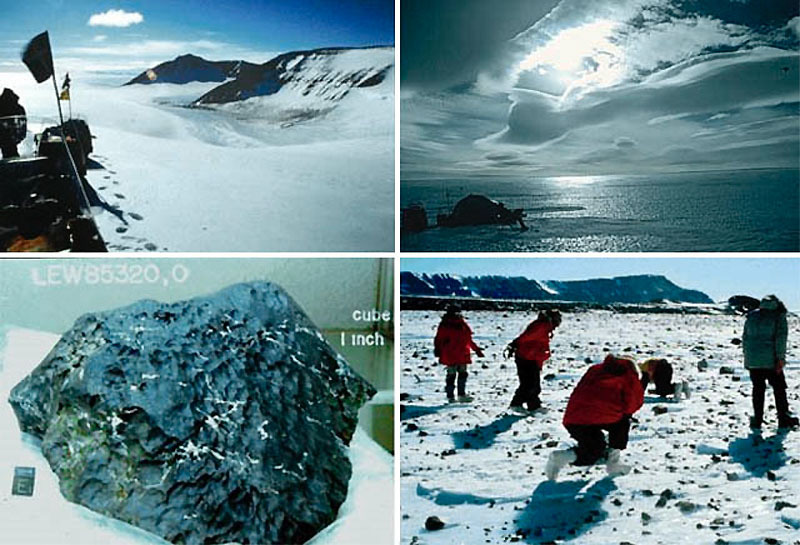 Does Antarctica have the most ghosts of any continent? On a per capita basis, the answer is yes. 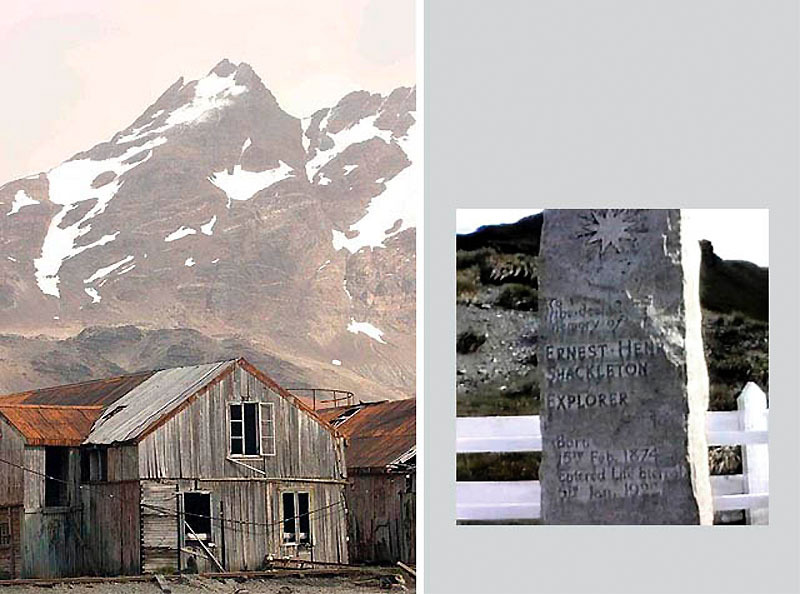 In addition to having a light work load, Antarctic spirits also have an abundance of residences to choose from thanks to the huge number of ghost towns and other such haunts. 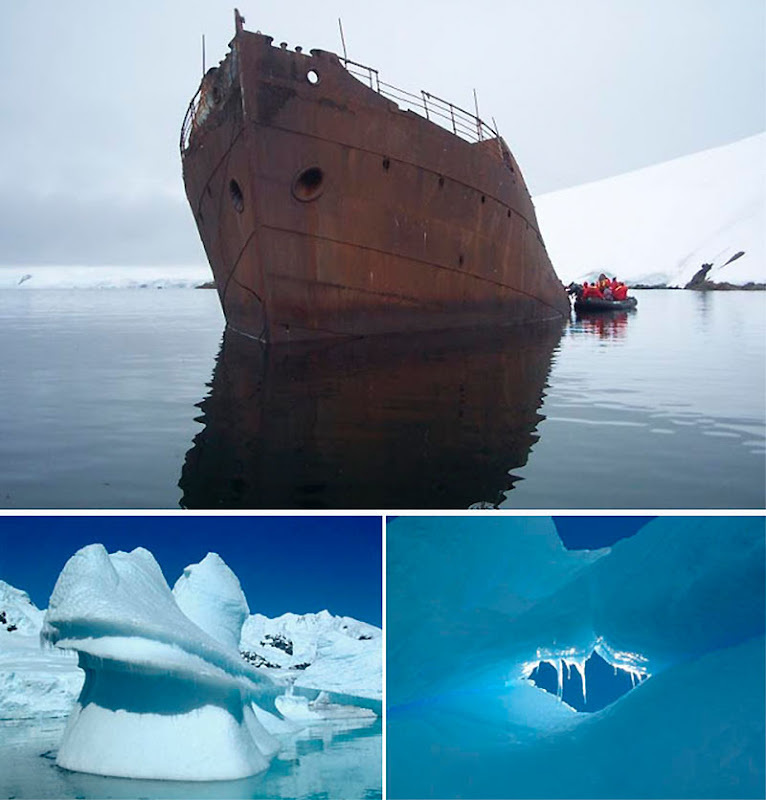 For obvious reasons, Antarctica is a very popular place to abandon. 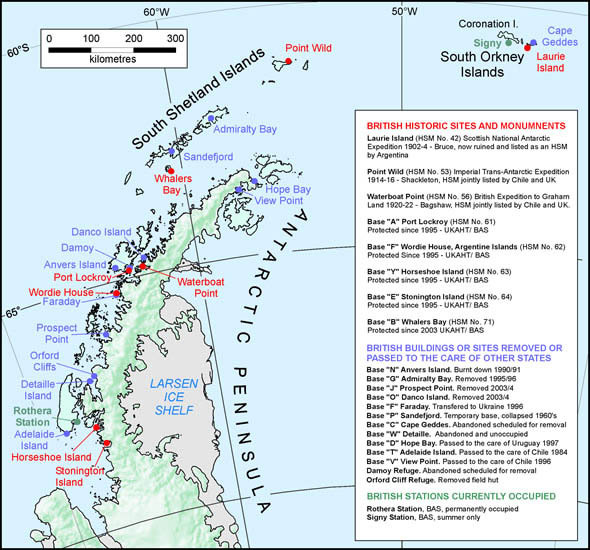 Below is a map of places abandoned by just the British on the Antarctic Peninsula. The most famous and disturbingly well-preserved of these places is the camp built by Robert Scott and his party on Ross Island in 1911. 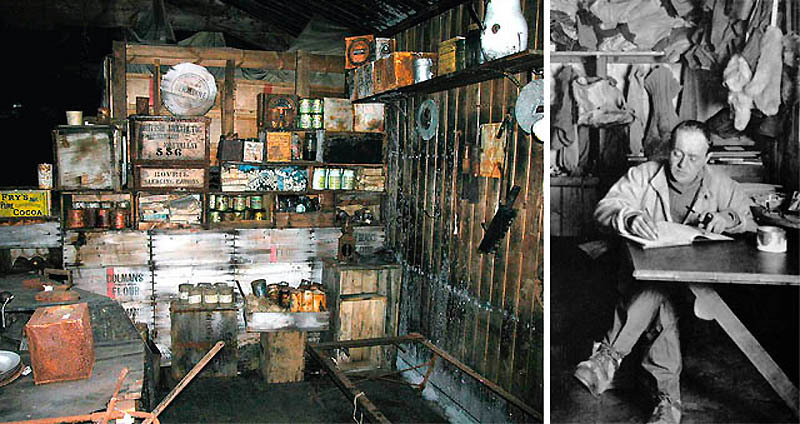 The seaweed-insulated wooden cabin and its outbuildings were supposed to be the team’s shelter when they returned from their attempt to be the first people to visit the South Pole. Scott and four others -- Edward Wilson, H. R. Bowers, Laurence Oates and Edgar Evans -- set out from the base to reach the pole. They reached it on Jan. 17, 1912 only to find that the Norwegian explorer Roald Amundsen had gotten there weeks before them. All five men died trying to get back to the base camp. The final three – Scott, Wilson and Bowers – were just 11 miles from it when they died. 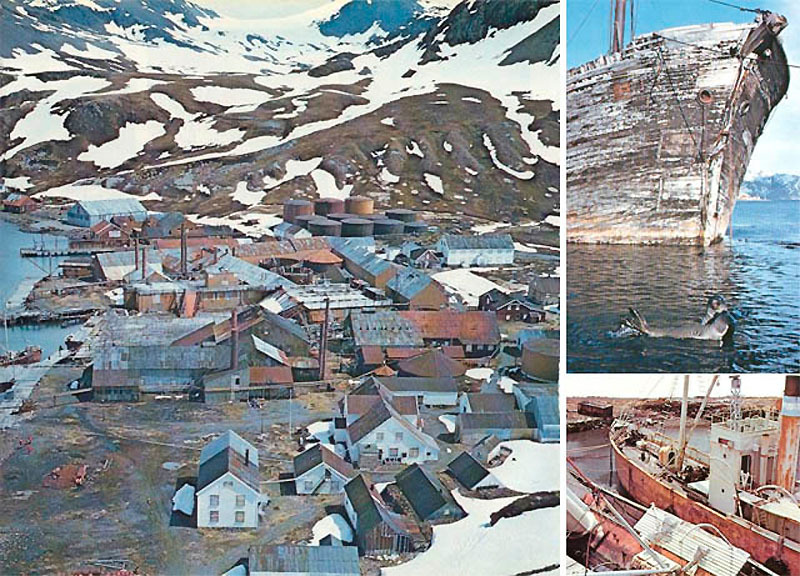 In 1906 a Norwegian-Chilean whaling company started using Whalers Bay as a base for a factory ship. 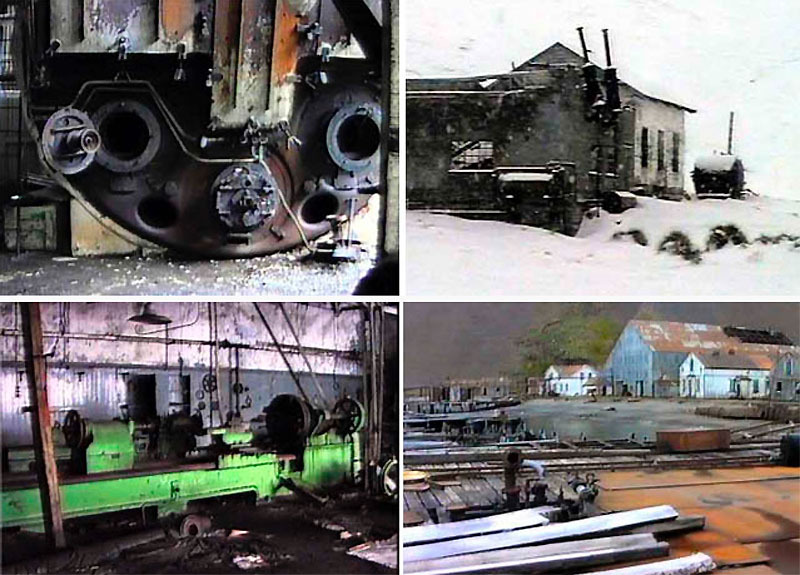 Other whaling operations followed suit and a boom town was born. 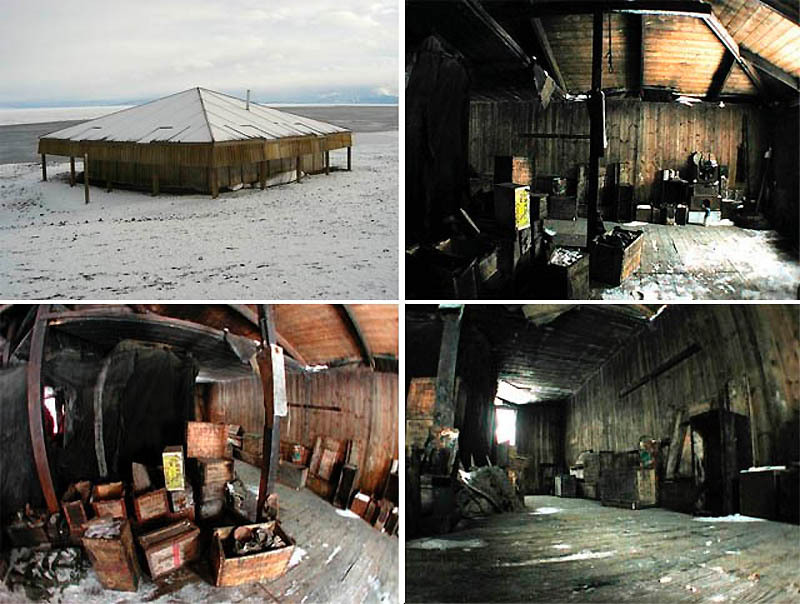 Whalers Bay was abandoned in 1931 following a precipitous decline in the market for whale oil, a result of the Great Depression. Do not be deceived, however. 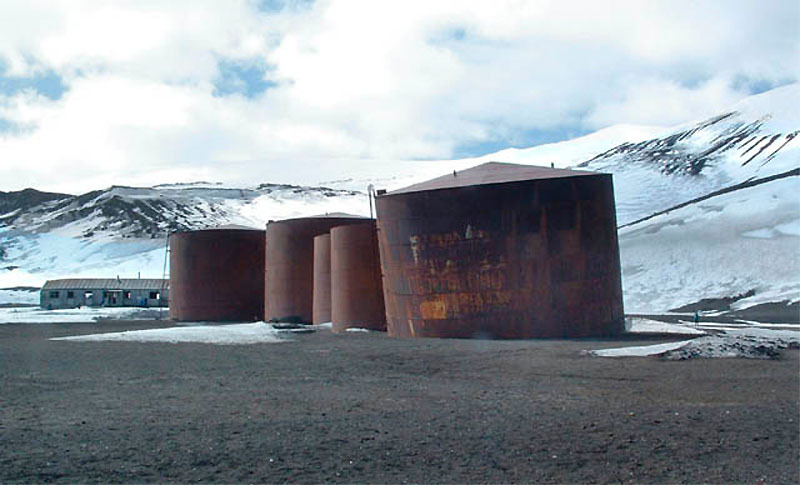 The rest of Deception Island is actually a fairly hopping place. 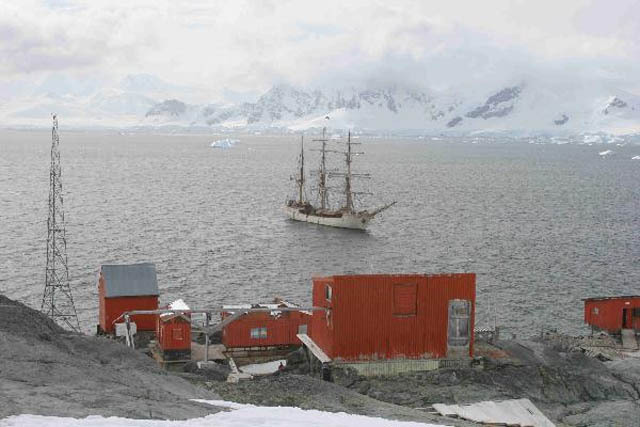 In addition to science bases operated by Spain and Argentina, it is also one of the more popular tourist destinations in the Antarctic. This is probably because (thanks to volcanic activity) the island actually has places where one can be warm. 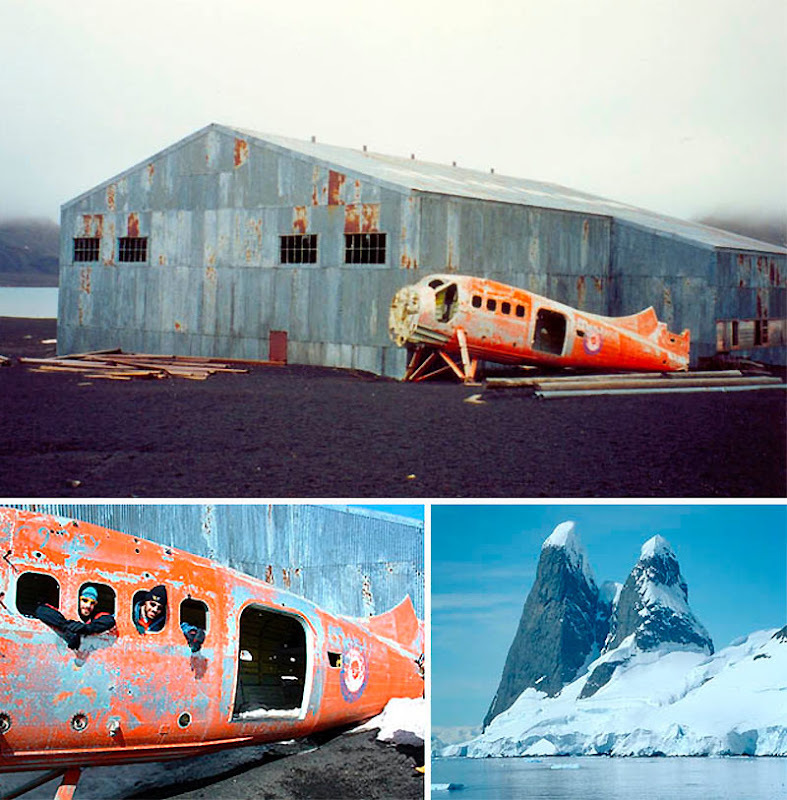 South Georgia is another Antarctic island that people rushed to abandon. At least seven whaling communities existed there during the first half of the 20th century. When all were up and running the island was estimated to have 2,000 people living on it. 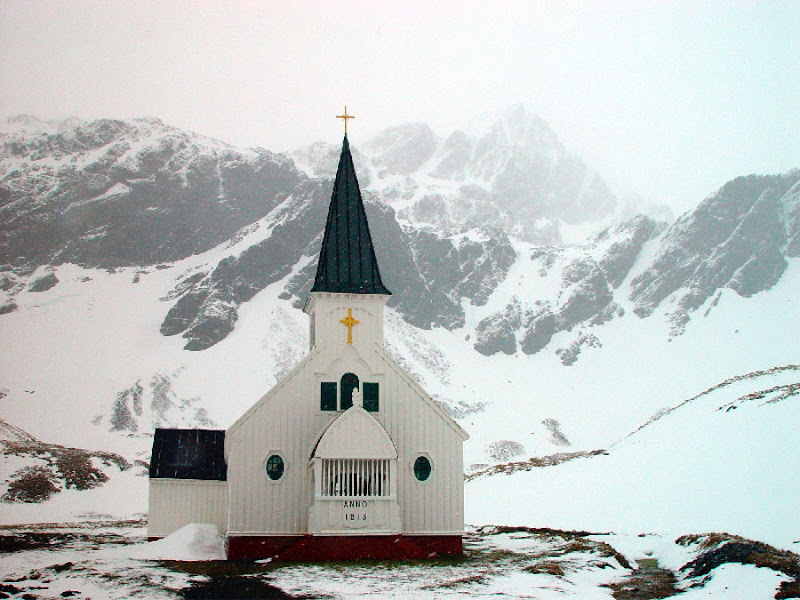 Most of the towns are in the process of returning to a state of wilderness but some buildings – notably in the town of Grytviken – have been kept up and are also becoming a tourist destination. The whaler's cinema... and some old harpoon guns. It is worth noting that these frozen islands have been the subject of heated arguments over who actually owns them – mostly by the UK and Argentina. Deception was initially claimed by the UK and then apparently ceded to the Argentines. South Georgia and the South Shetland islands are still possessed by the UK. The dispute over ownership of South Georgia was a contributing factor in The Falklands War (described by Argentine writer Jorge Louis Borges as “two bald men fighting over a comb”) and was briefly occupied by the Argentines. It is possible wars have been fought over more useless pieces of real estate but none come to mind. The Real "Mountains of Madness"
Some meteorites arrive from Mars, some come from further reaches of space... All this somehow gets me thinking about unmentionable parasitic alien organisms, so I better stop at this point. Article is written by Constantine vonHoffman and Avi Abrams. Constantine vonHoffman is a journalist, sf writer, and alleged humorist; visit his site "Collateral Damage"
Speaking of Mountains of Madness and aliens, I would recommend the reading of "At the Mountains of Madness", by H.P. Lovecraft. A great novel depicting the epic journey of a scientific expedition on the antarctic continent. I've been in Scotts' Hut at Cape Evans. I stood next to his bed and saw the newspaper he left on the table. I admit that I felt a very eerie feeling and think that the 5 that died visit their abandoned huts. 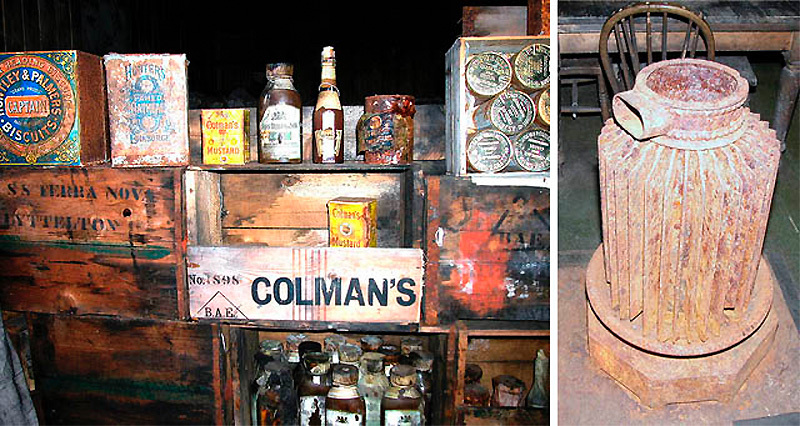 The article only mentions Discovery Hut but the better preserved is the one at Cape Evans where they were last. You can still smell the ponies. Correct, its not a harpoon its a power saw for slicing the heads of whales prior to boiling down. I have seen one of these in action at Cheynes beach whaling station at Albany Western australia, 1970s. The place was horrendous. I would LOVE to explore these places! It's amazing to see these kinds of bases, I wonder how much money has been spent on bases that are abandoned. Your storyis all kinds of.. I dunno... wrong. You say 1000 to 4000 people at South Pole depending on the season? Sorry bro but there is only one south pole station and it cannot, ever, accomodate 1000 people. try 300 in the summer (max) and about 60-90 winter (depending on budget). Your source is about Antarctica... NOT the south pole. Calling all of the Antarctica as "south pole" is like calling all of Europe by the name London. Or better yet, its like calling All of north America by the name of Quebec. You say that Antarctica has the highest number of historical deaths (ghosts) relative to current population of any continent on earth. Considering the rate of population increase, this didn't immediately strike me as being wrong. However, the low end of estimates for the integral of human population over its entire history is 100billion, giving a global average of more than 14 dead individuals for every living one. This ignores declining infant mortality (assuming they qualify as ghosts? ), but my guess is that Europe is the true recipient of the title in question. Love this comment. We need more semantics like that. Thank you. The Falkland Islands has offshore oil, it wasn't a useless piece of real estate. Does the writer of this reporter believe in ghosts because he/she implies a very biased opinion about ghosts? Can I make a point, in being Spiritualist? Ghosts are attracted to human energy. They make contact with us using it, and keep themselves energised using it. So, if you were a ghost, would you rather be in Antarctica (where not many people live), or a bustling city filled with people, such as Seattle or New York City? Really, ghosts don't aimlessly wander barren lands or graveyards. Great post! I love the pictures! Leaving aside the J.L. Borges comment about the Falklands' War (and by NO MEANS supporting any kind -or any other- of armed conflict), I must say the notices of the early dead of the Antarctica have been greatly exaggerated. Argentina and Chile maintain a healthy population in several bases around the Antarctic Peninsula (a friend of mine spent two campaigns in one of them). As for the use of the "wasteland" when referring to the Falklands, international jurisprudence dictates that the domains of a certain country extend up to 200 nautical miles over the Continental Platform, which gives Argentina sovereignty over them. The British Empire took them by force in 1833, has been exploiting the vast wealth of seafood which can be found there, and now is starting to extract the oil. Again, the midnight madness started by General Galtieri during the Lead Years in my country (which led to several death Argentinian and British soldiers) must not be justified by no means. But the claims of the British stating the Malvinas Islands (the name we gave and still give to the Archipelago) belong to them are simple ridiculous and unfair. interested readers, check out Kim Stanley Robinson's "Antarctica,"
which features great discussions of Shackleton, Scott, as well as geographic details that will interest you. plus great characters! 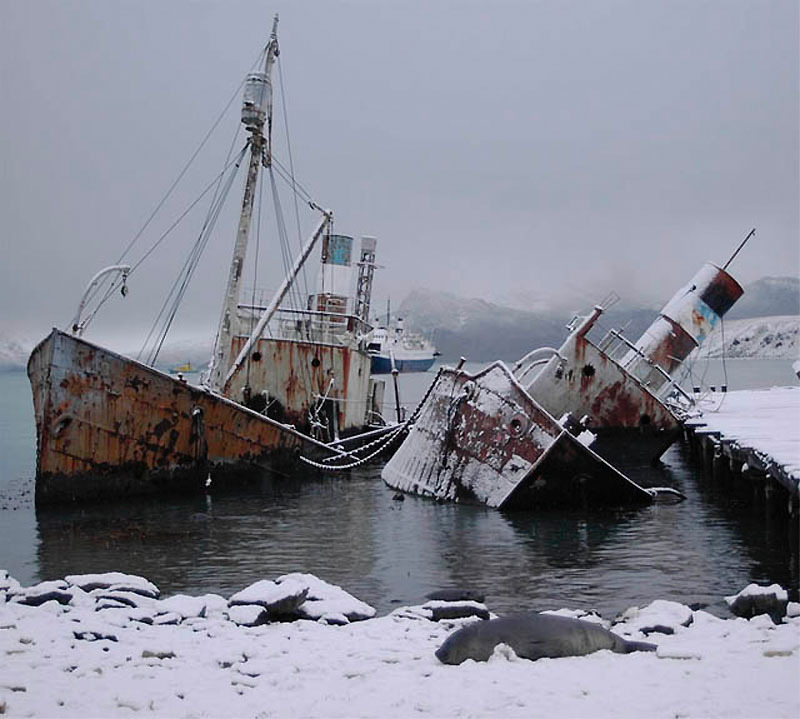 Behind the half-sunken Grytviken ships I believe we can see another ghost, the Lyubov Orlova..
Scott, Wilson and Bowers died 11 miles from One Ton Depot. That was not their base camp; as the name indicates, it was a large cache of food and other supplies meant to be used by the men on their way back to camp. From there, they would have still had over 100 miles to get back to safety at Hut Point, and in their weakened condition, plus the Antarctic winter, it's unlikely they would have made it. Can I make a point, in being Spiritualist? Ghosts are attracted to human energy. They make contact with us using it, and keep themselves energised using it. So, if you really believe in ghosts, you are a gullible idiot.